Life Is What Happens: Yoplait and the cure? The other day I posted about a couple who had created a day to celebrate on August 18 - Bad Poetry Day. They claim, that because they own the "branding" of this day that if anyone wants to use it, they have to notify them or pay them. I find it very frustrating when companies decide to brand or copyright words and phrases for profit. It seems as though they are depriving us of a language birthright. We should be able to use all the words available to us in our Mother Tongue(s). For example I knew of the Komen Foundation's branding of "For The Cure" in relation to any charity wishing to raise money for Cancer. Well now you can't use this phrase, because the Komans own it. You cannot legally have an event that is named "Quilt for the Cure" for example or the Komen lawyers will bully up on you and make you stop. Read about the problems "Mush for the Cure" had in this article from the Huffingtonpost. The Komens are linked with the brand, Yoplait - hence the title of the post. There are other more well known examples such as using the term "Super Bowl" to promote any parties that you or your locals may be hosting on that revered day - bottom line is, you can't use the term. There is also a lot of branding of genes isolated from our DNA that are used for medical research - or not - unless you are willing to pay huge sums to the original companies which isolated the genes. Here is a very interesting, but lengthy post on 5 items that you won't believe are legally branded. I can certainly understand copyrighting a trademark, that you have and want to protect or a corporate slogan. However, "We make the best widgets" should not mean that no one else can use the phrase "We make the best.." Someone else should be able to own "We make the best Kazoos," for example. 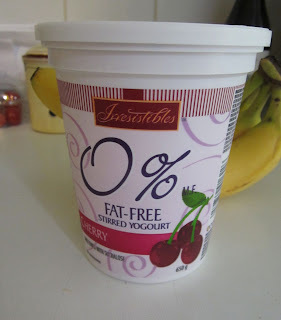 The picture - store brand yogurt - the best I could do in the word and yogurt wars. My particular bugbear is Mark Coop who has managed to trademark Keep Calm and Carry On. The couple who found the poster and put it up in their shop have fought the application not for their own gain but to prevent any copyright at all. They have just lost again. http://keepcalmcampaign.co.uk/ Oh and Sarah Blake the author of The Postmistress would have done well do have done a spot of research before describing London as "covered with Keep Calm and Carry On" posters. How I hate sloppy writers. Mark Twain channeled the frustration of many artists when he wrote, “Only one thing is impossible for God: To find any sense in any copyright law on the planet.” from Mark Twain’s Notebook, 1902-1903. I feel the same way. What can be copyrighted if it if available in plain sight? How can common words placed in a certain order be wrong? Geez, people could get in so much trouble without even knowing why when they try to use simple phrases. Such a shame! General Mills owns Yoplait... so that has nothing to do with it. And, AmyG, why shouldn't there be standards for the choice of organic? Would you want anyone to claim what they made was organic? I'll bet you would be among the first to complain if Johnny Boo used all sorts of chemicals that were based upon carbon and wanted to claim his product was organic (which it technically would be)! It's such a load of twaddle..this being able to copyright words....*}%*# to the lot of them! The fact that words can be copyrighted leaves me speechless. Surely they belong to everybody? Warner/Chappell Music owns the copyright to the song "Happy Birthday". Okay, it's a song, but still. A different perspective: the Masaï want their name and image to become registered trademarks. In their case, they want to benefit from the money brands of all kinds make in using them for advertising purposes.